This is an instrument I've owned since 2001. 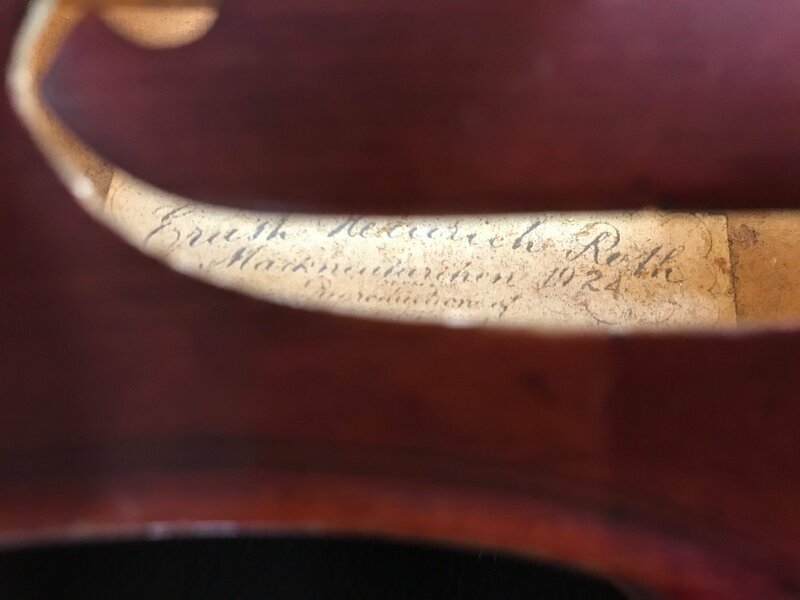 The label says Roth, but I'm doubtful that it's true, and just curious of any of your opinions on the instrument. Not sure when the 5th string was added or who by. 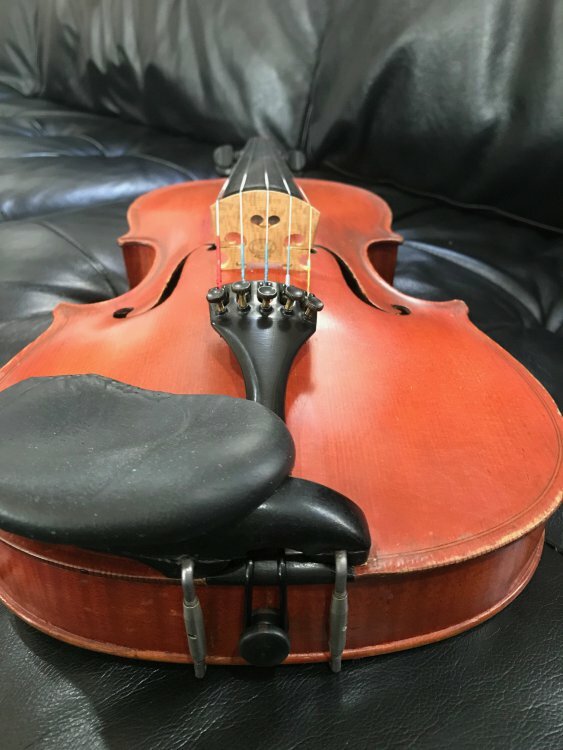 I purchased from the famed fiddler Byron Berline, so it's more sentimental to me than anything. Agree doesn't look like a 1924 Roth. Looks lower end French to me but I've been wrong on this many times. To me this looks like any number of Markneukirchen violins from the period (1920s-1930s). It doesn't look like a Roth and the label looks like a photocopy. thats the only Oscar I can think of, except for the grouch. Oscar meinel is a trade name of Roth as far as I recall. I have a bow labeled Oscar meinel. It wasn't Oscar Meinel ... not a name associated with Roth. Fake Roth labels seem to really be on the rise. So are genuine Roth prices! It has the divided bottom ribs. But did the Markneukirchen violins of the 1920 - 30s still get built on the back? The corners don't look like they were clamped, from what I can see but the pictures aren't showing enough detail. I think you're confusing things. MK circa 1920 would be mainly outside mold, which you can do with mitred corners (either way) or pinched corners. I just haven't seen too many MKN from that time ; mostly Roths and they are quite different. I would add "almost always" for BOB, too, I just have a Hamm with an undivided bottom rib and have seen some others built on the back with the same feature. Good point - nothing is ever 100%! A. If they are pinched, can they be distinguished from a BOB construction? B. If they are mitred with the joint line in the c-bout, can they be distinguished from inside mold construction? A. 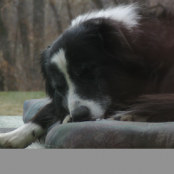 Outside mold would be extremely symmetrical with corners at right angles to the plate planes, whereas BOB tends to be full of irregularities. B. The blocks sit differently with regard to the corners. But apparently Vuillaume and a number of later French makers simulated the look of Cremonese construction while using an outside mold. as as far as I know no maker in Voigtland (Markneukirchen , Erlbach, Wernitzgrün, Klingenthal etc.) 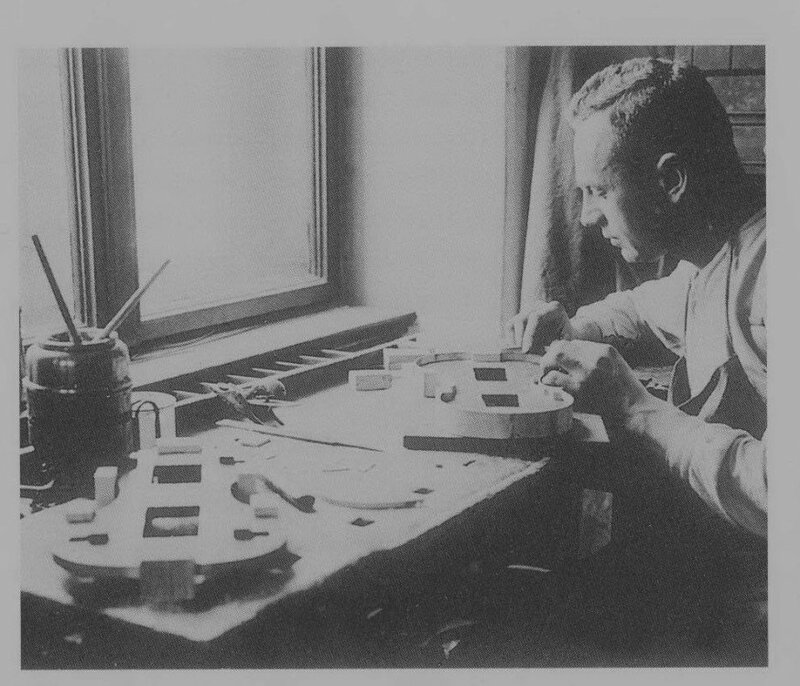 ever used a mould and this includes violins from manufacturers like Roth. When I worked in Erlbach I was taught the method of 'Aufschachteln' which is extremely precise when practiced enough. When building the corpus makers put the assembled top ribs and back on a flat board to make sure that it is not wobbling. This gives often the impression that it was made on an outside mould. 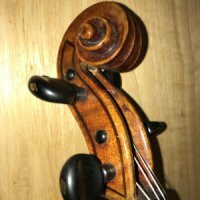 The back joint on a violin made on an outside mould is not necessarily in the perfect center. On Markneukirchen instruments almost always with an allowance of 0mm. I had no idea. I thought by the mid 1920s pretty much all trade instruments of any quality were made with an outside mold - thanks for enlightening me. 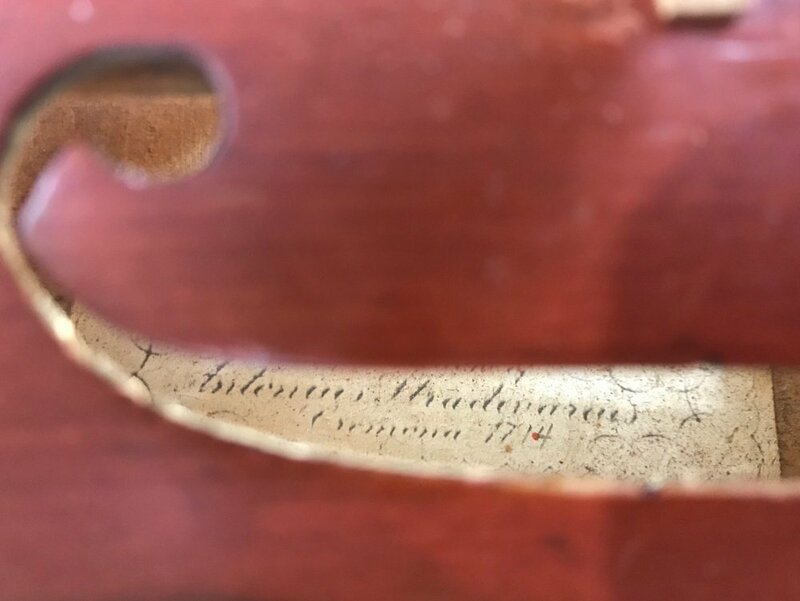 I think I have seen a lot of early 20th century Vogtland violins built most probably using an outside mould. This might apply more to bigger shops like CG Schuster and the like, having mitred rib joints which usually should indicate this method. I once sold a Louis Dälling which looked like that. Are you sure the Roths from the 1920 - 30s were built on back as you described? So the corners would be clamped; I'll have a look tonight at a Roth in our orchestra. You can build the instrument without mould and not clamp the corners. Now comes what you want to know. The building of the ribs starts with the c rib. You bend the c ribs and the linings for both sides. You check with a square if it stands in a perfect right angle on the back and can exchange left and right c rib to see if the symmetry is perfect. Then the bent linings are glued in place before you glue it on the back. Then you make upper and lower ribs the same way. To fit them at the corners you can cut a narrow flat surface on the c rib to make sure that the glue is better holding without a clamp. Last are the corners and upper and lower block to hold everything together. Ekhard Richter one of the elder makers at that time always assured me that in 'Neikirgn! (Markneukirchen) no maker ever used a mould. And another guy said that nobody had the intention to build a wall . 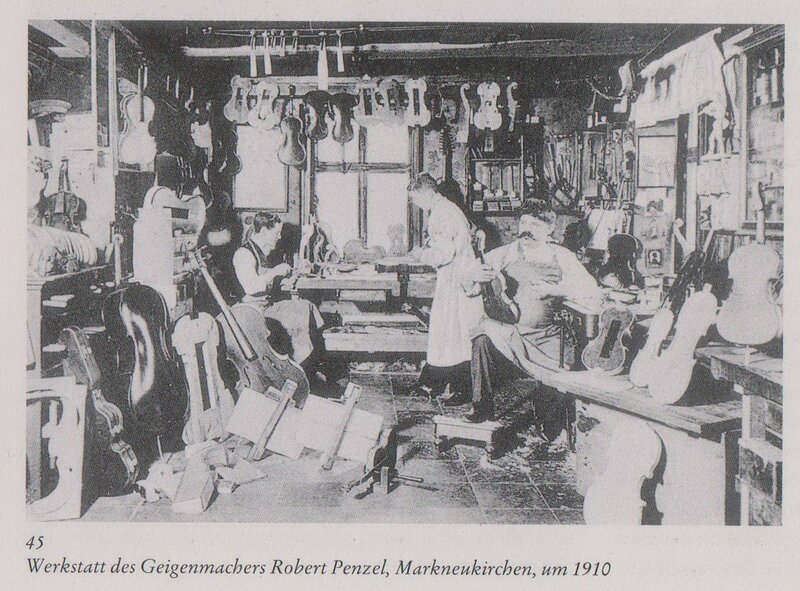 There are so many photographic examples that they were using at least inside moulds, here at the Penzel shop, both in Markneukirchen and Klingenthal, that it's very unprobable that these are just arrangements. I'm a bit suspicious about "official" statements of elder Mnk makers, there are so many traditional tales, also to ascribe low quality mass production in instruments and bows always to other places like Schönbach, Klingenthal or Graslitz.